Needed – 2 Choc cake mixes (and eggs oil and water as directed) – 5 packages Cake Mate Easy Squeeze Icing – White – 1 package Cake Mate Easy Squeeze Icing – Red – 3 Blue Fruit Rollups – 4 Red Life Savers – 1 Package Black Twizzlers. I mixed up 2 packages of chocolate cake mix for this birthday cake and baked it for 29 minutes in a 11×15 cake pan. (I had lots of left-over pieces so I’m sure you could get by with a smaller pan and putting pieces together but I like to cut out one big shape). 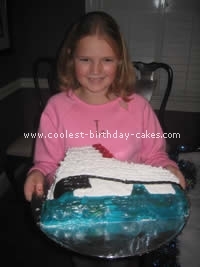 After the cake cooled I cut it out in the shape of an ice skate. The width was 11 inches at the blade and 9.5 inches tall at the tallest part of the boot. Frost all of the birthday cake except the blade with the white frosting using the star attachment. This was the first time I’d used the Eazy Squeeze Icing and it made the job much easier! Cover the blade of the skate with blue fruit rollups. There are 2 small sections of cake that are below the boot and above the blade. 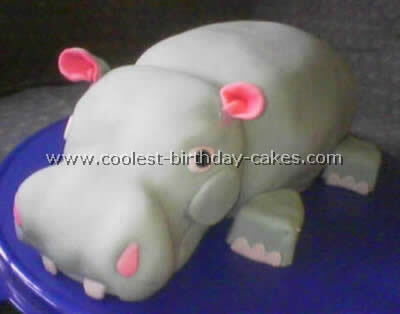 I smoothed the icing in that area to give it a different effect since it’s really just background. Take a black Twizzler and cut it in half. Use it to line the sole of the boot. Then cut Twizzlers to appropriate length to make the heel on the boot. I placed 4 red life savers at the top of the boot to make the loops for the laces. Use the red icing to make laces criss-cross through the life savers and down the side of the cake. Continue the criss-cross pattern down the side and stop about 2 inches from the toe of the boot. You’re done! I hope you enjoy your ice skating party and birthday cake! My niece had an ice-skating birthday party so I made an ice-skating birthday cake. 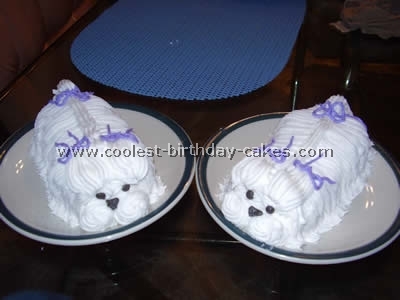 I used two full rectangular cakes using standard box cake mix and canned icing. I froze the cakes to make carving and sculpting easier. 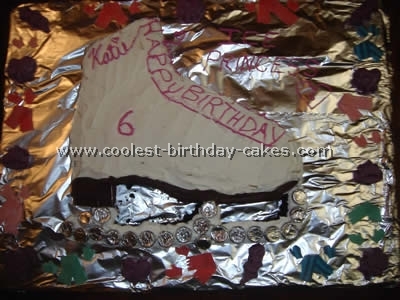 I carved out the shape of the boot, iced it and devised the laces to read Happy Birthday Katie. 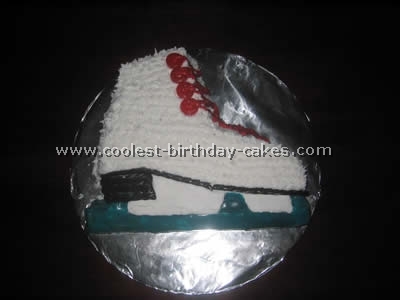 The actual skate portion was from a separate cake and carved into the skate shape and attached with icing to the bottom of the boot. I peeled the foil off the tips of the Hershey’s kisses and poked them into the skate portion on the birthday cake to make the skate look metallic but still be edible. The bottom of the boot looks hard because I used melted Hershey’s chocolate for the bottom and the heel. So when it dried it gave it a much harder durable appearance. The embellishments are violet chocolate molds. My favorite embellishments are the scarves and mittens cut out from gummy ribbons and Bubble Tape. I just used a clean pair of scissor to cut their shapes.